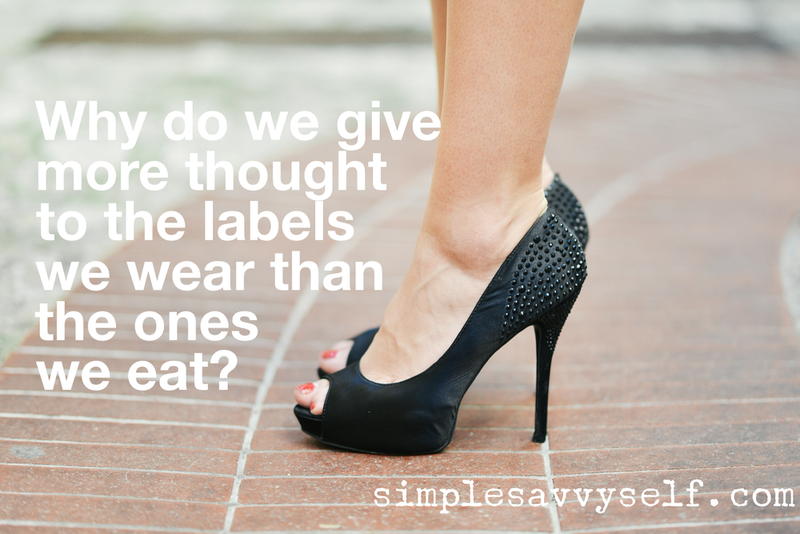 Why do we give more thought to the labels we wear than the ones we eat? — Simple.Savvy.Self. How often do you read food labels? And if you are reading labels, how often do you scan beyond the fat and calorie content to look at actual ingredient list? If your answer to one or both of these questions is, honestly, not that often, then you’re not alone. We have been programmed by the food industry to believe the claims on the front of the package. After all, they can’t lie (can they?). As a result, we miss the opportunity to really understand what’s IN our food before we make the purchase. We’re spending our hard earned cash on food that is being touted as healthy, but, so often, that is just not the case. These days our attention spans are fleeting and the industry knows this. They bank on us not taking the time to fully read labels or the fine print. The don’t expect us to really figure out how many servings the package contains to get a real sense of how much sodium or sugar we’re feeding our families. Instead, they want to grab our attention (and our wallets) with a few buzz words that appeal to our healthy intentions when navigating the aisles. Buzz words like: gluten-free, less than 100 calories per serving, all-natural, high in fiber, lowers cholesterol, heart healthy, immune support, packed with antioxidants and so on, and so forth. Here’s your simplesavvy tip: Do yourself a favor and ignore the front of the package. Disregard it completely. Flip the package over and pay attention to the nutrition label and, most importantly, the ingredient list. Rule of thumb: If it's a paragraph long, has sugar listed as one of the first ingredients or contains a bunch of words you don’t understand or can’t pronounce, put it back on the shelf because the likelihood is it's highly processed and you're better off without it. I encourage everyone to become their own food detective. What's one packaged food you can ditch this week? Share in the comments below.